Christmas card exchanging is my Fav. I LOVE IT. I am so excited every day to check the mail and get more then just the endless papers of coupons and advertisements....actual envelopes, with cute stamps?! Hooray! I am in heaven. Since I love it so much, I send out over 200 Christmas cards every year, its intense. No, really. And thus, it is expensive (especially since stamp prices keep going up, sheesh!). So to pinch pennies where I can here are a few of my budget saving strategies! 1. Make you own! There are so many amazing and free picture editing sites out there, such as PicMonkey and Canva. 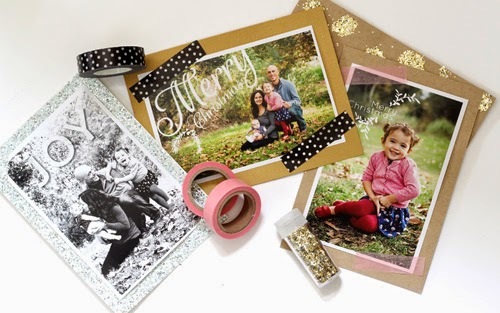 They make it so easy and fun to personalize and give a photo the pizzaz you want to be proud in sending out those annual beloved family pictures. Just upload your picture throw on a festive phrase in a cute font and booyah- your own christmas cards have been born. You can check out my friend Morgan's blog, for a cute "make your own cards" tutorial for inspiration. Then you just hop that pdf over to a place like Costco and you could have your own cards for as little as . $.13 a piece! A note worth mentioning is many other printing sites like Shutterfly or Snapfish offer free printing for first time customers, so make sure to look into that too! See how cute Morgan's handmade cards turned out?! Plus I get to feed to my addiction for Washi tape?! Sold. 2. Find FREE Christmas Card Promos. 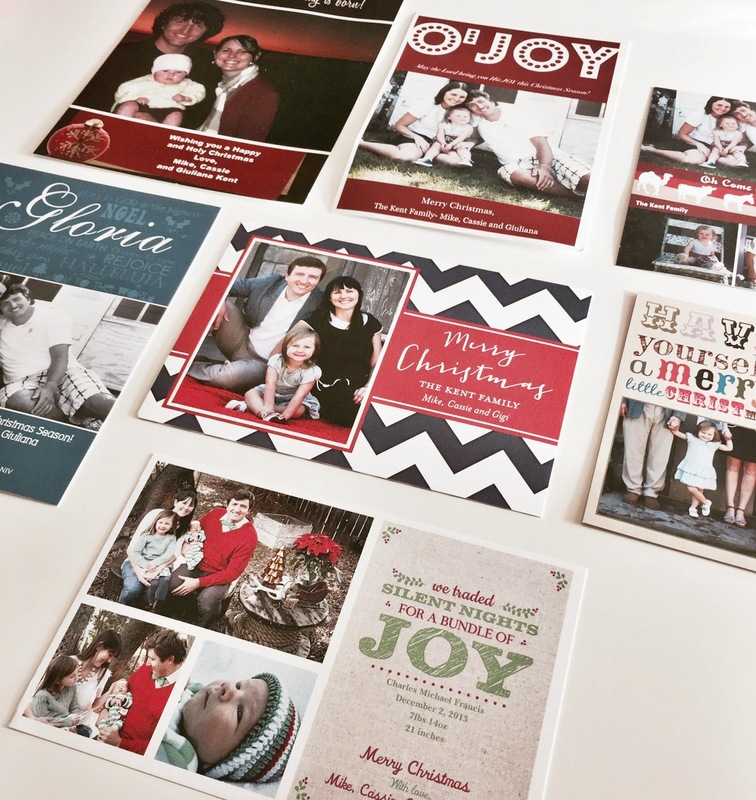 Many printing companies offer free Christmas cards around this time, so be on the hunt for those. I love following Hip2Save for all sorts deals, so checking there often and you will never miss a steal of a deal! And right now one of my favorite stationary company's, Tiny Prints, is doing a promotion for 10 Free cards! 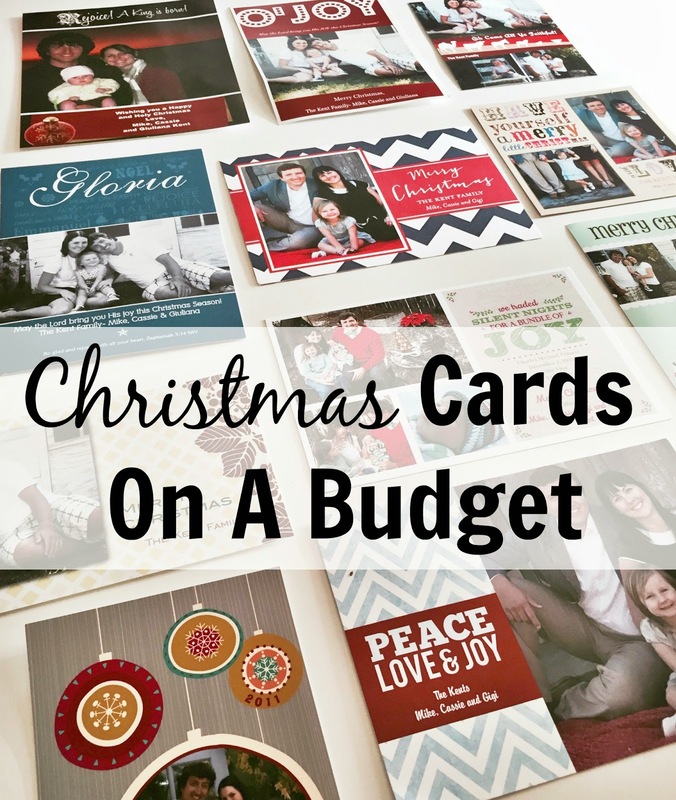 A few years ago I took advantage of all these kind of promotions and spent around $20 total for all my Christmas cards, plus I thought it was fun having a dozen different variations of our family photos smeared over all the cards! 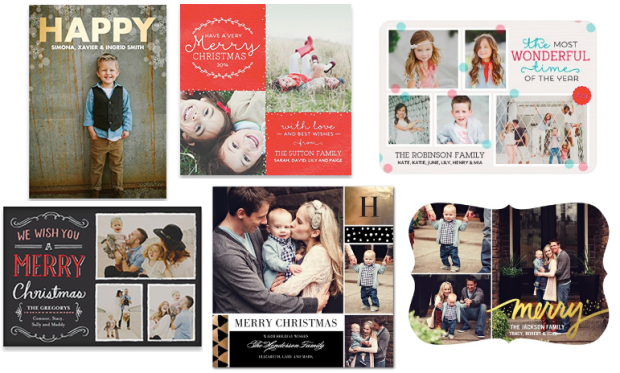 Tiny Prints is offering 10 Free Cards for new and existing customers through 11/ 12/14! Head on over to their website and at checkout enter the promo code 10FREECARDS and pay shipping ($5.99) and your good to go, a cheap little beginning to your stack of Christmas Cards! Also, if you are a returning customer of Photo Affections you can get 10 Free Holiday Photo Cards by going to PhotoAffections.com/10free. 3. Purchase them at a discount. Check out all the deal sites like, Groupon and Living Social for promotions where you are given a deep discount. For example Groupon is currently having a deal for the printing company (who sells christmas cards), Zazzle.com, where you get $76 dollars worth of product for only $24.99! Wow, that is crazy! So check into Zazzle see if you like any of the Christmas card options and if you like some, make the purchase. I have bought several of these type of coupons through different companies in order to get the most for my money. In order to not miss out on any deals, such as this one, subscribe to get email updates to a deal site like Groupon. Thanks Laurel! I am so happy you found this helpful, and that is a great tip too- thanks for sharing! Love this round-up of ideas! Now, to take a family photo to use! Thanks Amanda, glad it was helpful! I am so bad about sending Christmas cards! I buy them after Christmas for the next year and then I always put off sending them and dont.... maybe this year! Awesome tips Cassie! My task for the weekend, so this couldn't have been more perfectly timed! Yea! I am happy the timing for you worked perfectly! Happy card-ing! This is so helpful! I will definitely keep in mind for next year, since I'm getting mine through Tiny Prints this year. I love the washi tape and the gold glitter! So fun! Like you I am a huge fan of sending Christmas cards (and receiving!) I've definitely seen a decline in Christmas cards tho, for us anyway, and I contribute it to the cost. These are some great ideas! Thanks for the shoutout!! Love your Christmas cards every year and can't wait to see the selection this year! These are such great tips.